Weather Station and Stationary Camera installed! The infinite patience and persistence of Wolfgang Nadler has paid off. We now have an operational weather station (support funding from the College of Arts and Sciences – THANK YOU!) and stationary camera atop Disque Hall. The Vaisala weather station will provide us with measurements of Temperature, RH, Pressure, Wind Speed and Direction, Rainfall, and solar radiation. We’re looking to expand and include additional measurements. Plans are in the works to have a real-time feed of real-time weather data along with photos of the Philadelphia skyline. 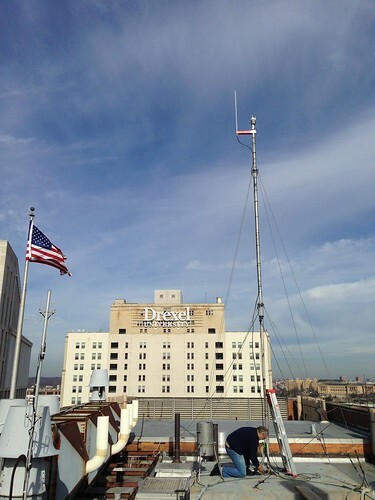 Black Carbon and CO2 measurements during Philadelphia Snow Storm on January 21, 2014 from DeCarlo Laboratory on Vimeo. Carbon dioxide (CO2) decrease after noon is because everyone went home from work early to avoid getting caught in the storm. Usually CO2 stays higher for longer in the day. Spike in Black Carbon (BC) and CO2 are because of the emissions from a freight train about 30 meters from the sampling inlet to my laboratory. This entry was posted in Research, Teaching. Bookmark the permalink.